Last week, news broke the Donald Trump had selected Indiana governor Mike Pence as his running mate. As often happens, people took to Twitter to check out what Pence had to say. Understandably, many of them went to @mikepence, who is not the governor but is instead a 49-year-old software engineer who lives in Florida. (His avatar is an American flag, which might have confused some people.) Given Twitter’s penchant for insightful and measured political discussion, we checked in with Pence to see what it was-like to be caught in the social media crossfire. What has this week been like on Twitter? I can’t begin to catch up with the mentions of @mikepence on Twitter. On the one hand, it has been hugely entertaining, since I get to troll conservatives a bit by pretending to be in a love affair with @realDonaldTrump using my account. On the other hand, any hope I had of actually using Twitter to have conversations with the many amazing software engineers that I know is pretty much on hold until the governor is (hopefully) no longer the talk of the moment. It is also interesting that for all of our obsession with our mobile devices, television appearances blow up my notifications like nothing else does. Are you getting noticeably more replies than you used to? Way more, but the vast majority of people are not paying any attention to what I have actually said on my Twitter account, or they would know that I am a liberal, atheist, ex–Jehovah’s Witness computer programmer, and not a bigoted shill for the Republican party who is all-too-happy to throw Muslims under the bus for a chance at power. What are people saying to you? Are they more supportive or critical? A bit of both. I have long gotten hate-tweets from the left directed at the governor that make me cringe. Getting a front-row seat to a constant barrage of vitriol from the left and groupthink and fan-boy-swooning from the right hasn’t left me with much hope for a political future where civilized discourse holds much sway. Do you try to let people know that they have the wrong guy or do you just ignore it? I have made attempts, but don’t generally waste the time to correct people. I have been on Twitter since 2007 and have been participating in social media as a consumer and as a developer for a very long time. It is not really a central part of my day any more. Has anyone tried to buy your username from you? Nope. I suspect that the Governor’s camp knows that I am not a fan of him or his ideology and that any attempt to buy the username would be a waste of their time. Why would I be an enabler of a campaign driven by such small-minded hate? 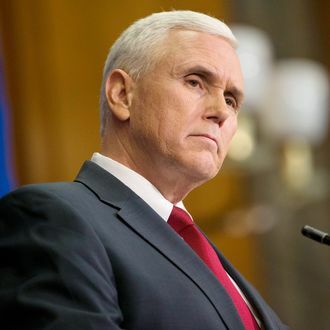 Do you own other Mike Pence usernames, like facebook.com/mikepence? Have you had any trouble there? I have had one fan of the governor try to friend me on Facebook. Otherwise, there has been no crossover. Do you have a plan for the rest of the year? Are you setting up filters or considering locking down your account? I am planning to keep the account because of the trove of valued contacts from my professional life that I am connected to there. Worst case, I get less value from the account because of all of the noise. I have a feeling that if the Trump ticket actually gets elected, that may well be the least of my worries, because I have worked in finance and I know how they react to uncertainty and instability. Today, I met up with a new running group for the first time, and got to say “My name is Mike Pence … unfortunately.” I am expecting a lot more of that. Would you vote for Trump/Pence? Never. I grew up a Jehovah’s Witness and was freed from that cultlike group by opening my mind to new information that I found on the internet. I similarly was a fan of Rush Limbaugh and embraced conservative values because they seemed harmonious with the values I was raised with. But now I deeply regret how I behaved toward gay people and how I shunned those who grew to believe differently than me. That is not love, and that is not the kind of person I want to be, nor is it the kind of thinking I want to see in elected officials. There Was No Russia Conspiracy. But Trump Is More Dangerous Than Ever. Who Was the Bearded Man at the Barr Press Conference? Where Warren leads, will other candidates follow — and will House Democrats be taken where they have so far refused to go? Should Democrats Impeach President Trump? Intelligencer staffers debate whether it would be principled or foolish to impeach the president with the election on the horizon. The severity of this misconduct demands that elected officials in both parties set aside political considerations and do their constitutional duty. That means the House should initiate impeachment proceedings against the President of the United States. Has Joe Biden Lost His Ability to Unite Democrats? If elite progressive concerns about Biden spread to actual Democratic voters, his status as a potential unity candidate could be seriously damaged. Cuban Players Helped Build the Modern MLB. America Doesn’t Want To Help Them. A man in Broward County, Florida was arrested for threatening to kill two Democratic presidential candidates and the first and only two Muslim women in Congress, the local Miami New Times reported. The feverish conspiracy theory hinged on the conclusion of the Mueller report. Now that’s only the starting point. Some Microsoft employees are openly questioning whether diversity is important, in a lengthy discussion on an internal online messaging board meant for communicating with CEO Satya Nadella. Two posts on the board criticizing Microsoft diversity initiatives as “discriminatory hiring” and suggesting that women are less suited for engineering roles have elicited more than 800 comments, both affirming and criticizing the viewpoints, multiple Microsoft employees have told Quartz. The posts were written by a female Microsoft program manager. Quartz reached out to her directly for comment, and isn’t making her name public at this point, pending her response. “Does Microsoft have any plans to end the current policy that financially incentivizes discriminatory hiring practices? To be clear, I am referring to the fact that senior leadership is awarded more money if they discriminate against Asians and white men,” read the original post by the Microsoft program manager on Yammer, a corporate messaging platform owned by Microsoft. The employee commented consistently throughout the thread, making similar arguments. Quartz reviewed lengthy sections of the internal discussion provided by Microsoft employees. For the second straight day, a national political figure showed his support for striking Stop & Shop workers. Democratic presidential contender Pete Buttigieg joined Stop & Shop employees on the picket line at the Malden, Massachusetts store at noon on Friday. He was already scheduled to be in New Hampshire campaigning this weekend. “I’m running for president largely because I believe that our freedom depends on understanding how to make sure the changes in our society work for working people. What’s happening at Stop & Shop, is an example of the exact opposite,” Buttigieg told the crowd. Among other things, the House Democratic leadership needs to show an impeachment-hungry base it’s willing to fight. If the GOP can’t put the rule of law above loyalty to Trump, then bipartisanship is a worthless ideal, and many congressional norms are obsolete. After some scary data in recent months, the economy seems to be humming along nicely again. House Judiciary Committee Democrats said Friday that they’ve engaged with the Justice Department about preliminary arrangements for special counsel Robert Mueller to testify next month. “We have had several conversations at a staff level with DOJ [Office of Legislative Affairs],” a committee spokesman told POLITICO. The committee has yet to set an official date for Mueller to come in, but Chairman Jerry Nadler (D-N.Y.) has indicated he wants Mueller to testify no later than May 23. You might have heard about the exceptional heat this year in the northern hemisphere and around the world. March was just declared the second warmest on record globally. Records have been shattered in Alaska. Scotland hit 70 degrees in February. Winter warmth has torched the U.K., Netherlands and Sweden as well — coming on the heels of Europe’s warmest year on record. But they’re not alone. Greenland is baking, too. In fact, its summer melt season has already begun — more than a month ahead of schedule. Lyra McKee, an editor for Mediagazer, died at the scene of a riot in Derry. Following the release of the Mueller report, the former FBI director took to the forest. The site revealed this week that it stored millions of passwords insecurely and scraped users’ email contacts to use for ad targeting. Sullivan: There Was No Russia Conspiracy. But Trump Is More Dangerous Than Ever. The Mueller report reveals a man who is a constant threat to the rule of law. Impeachment is the only answer. Someone is attempting to sell the video that allegedly shows New England Patriots owner Robert Kraft during a prostitution sting at a Florida day spa, a court motion says. The motion filed Thursday by attorneys representing the two women accused of running the Jupiter spa that Kraft is accused of patronizing, accuse law enforcement of violating a temporary protective order by leaking the video. Attorneys cited a report published Thursday on a celebrity news website that claimed it was “recently contacted by a party who claimed to have obtained portions” of the video. She’s only sorry she not “a robot” who tells the truth. Trump is swearing in tweets – how edgy! Years before flames ravaged Notre Dame Cathedral, the landmark’s custodians realized they had a problem. In 2013, the cathedral hired Didier Dupuy and his son to scale the building and install lightning rods at different points, including its central spire. Gaping holes and cracks they discovered in the lead roofing shocked them. Just below was a dry and dusty space of timber beams, known as “the forest,” that had supported Notre Dame’s roof for centuries. A job that was supposed to last a couple of weeks took three months as the duo performed emergency repairs before quitting in frustration.